We have been working in the yard a lot lately, getting things ready for summer. The pool has shaped up nicely. We planted some new flowers and added mulch. I thought it would be fun to set a table down by the pool. This table is small and intimate. 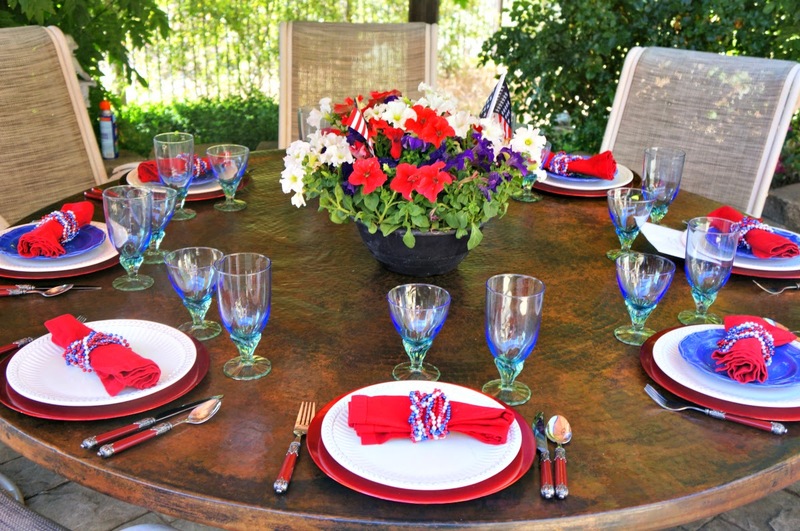 A pretty patriotic table set outside of the kitchen with the traditional red, white and blue colors. Even the vodka bottle is perfect for this table. I love adding whimsy to out tables. This french fry holder is from World Market. The chips are even in the colors and yummy. They also came from World Market. 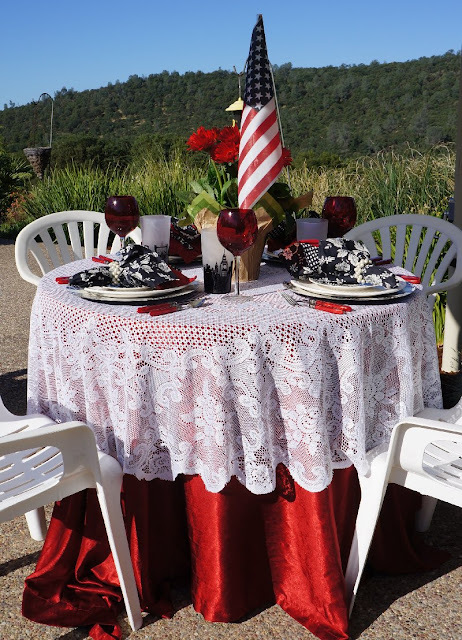 A lovely tablecloth perfect for this Patriotic theme. This particular dinner party was off our Breakfast room. We invited the neighbors over for a barbecue. Love using our large copper table for entertaining. The fabulous buffet island my husband built. He did a great job. It's a pleasure to entertain outdoors and serve a buffet meal. We always decorate each party with a theme. A picture of our clogging group a few years ago. Very patriotic costumes. Your husband is so handy! And you are so creative..a really perfect match in every way. looking great..have a loved MD weekend! you girls look so cute!!! 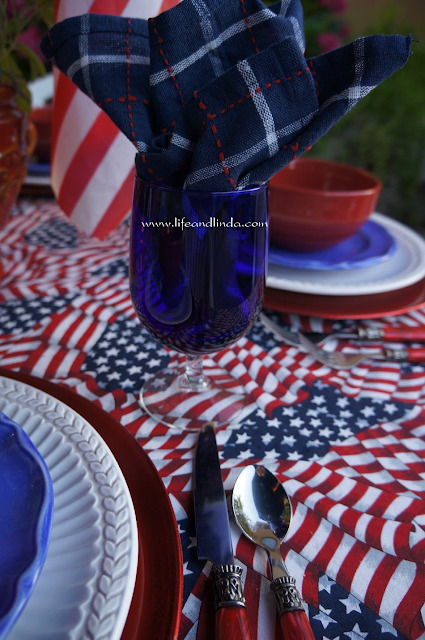 Hi Linda, your table setting are beautiful and very inspiring for the upcoming holiday through 4th of July. 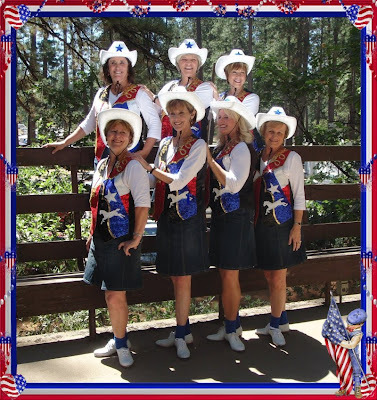 Love your outdoor areas by the pool and I love the pic of your clogging group. 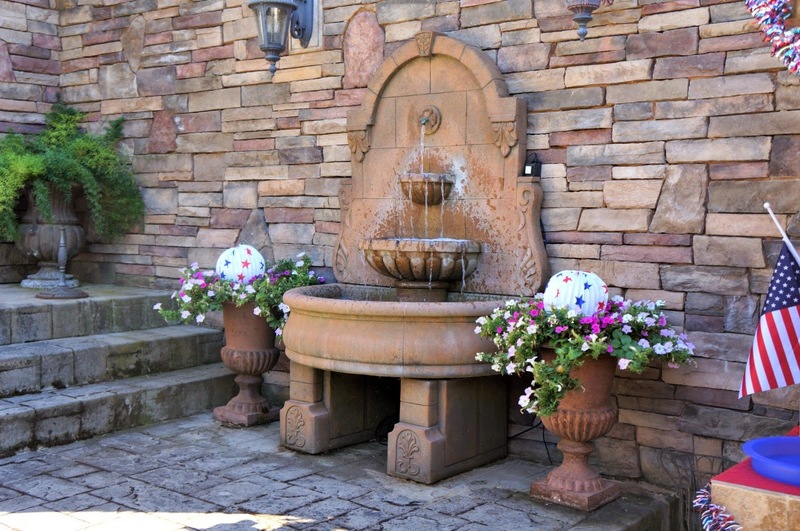 You have so many fun outdoor areas to entertain! What a great hubby to create such a fun island. Your pool area would be my place to want to eat - except the weather is still in the 60's here. I am sure it is much nicer there. You are too fun with all of your July 4th tables. I need to up my game for July 4th. We seem to be gone so much of them. All your tables are so patriotic and beautiful, Linda! I especially am smitten with the lace covered table by the pool. Your hubby certainly did do a great job on the island buffet! It must be such a pleasure to entertain at your lovely home, with the gorgeous views. I remember some of these tables. The copper table is so awesome and the large buffet island your hubby made is amazing. You have such nice landscape to entertain and relax in. Cheers to a nice Memorial Day weekend! What a wonderful view for your lovely table! I haven't even begun to think about Memorial Day tables but I will be wanting to now. And you clog too? As a former NC mountain child I admit I thought only we did that! Each table pretty and unique. The copper table is stunning and what a beautiful job your husband did on the island! I know guests love to be invited to your home. 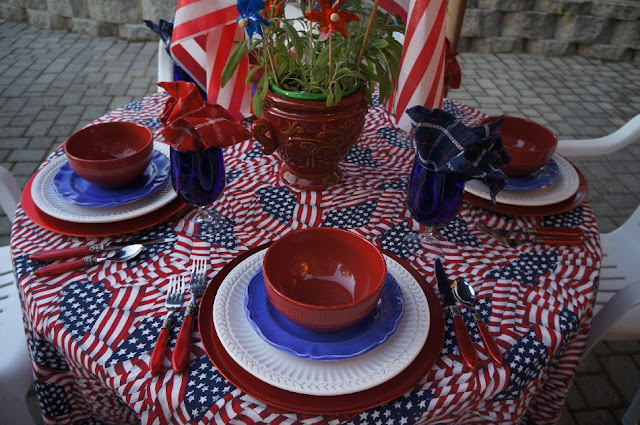 Your patriotic tables are eye catching and full of panache. Enjoy the Memorial Day weekend. 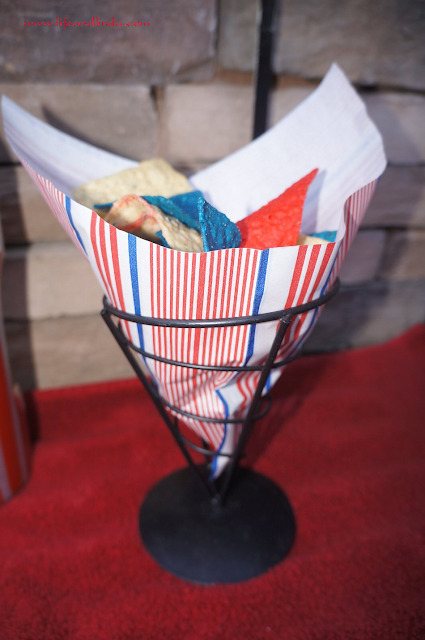 Your tables certainly set a beautiful patriotic mood. What a patriotic table! I want to come to your dinner party. The buffet island is absolutely beautiful. Your husband done well with that. I forgot that it was Memorial Day in the US. Beautiful tables! 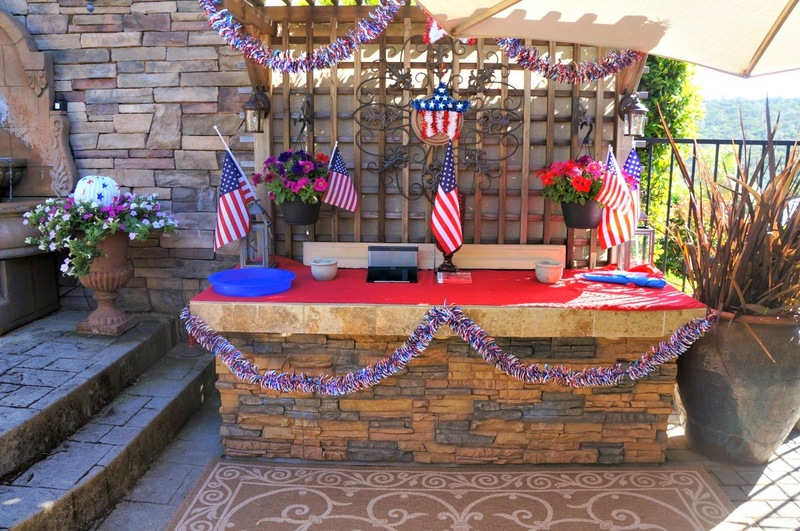 Hi Linda, you have decorated your tables so nice for Memorial Day and the 4th of July! You have such a nice poll and entertaining area! Hope you have fun this holiday weekend! Take care. Each table looks beautiful! You have such a lovely area to entertain and I'm sure the weather is predominantly pleasant all the time. We seem to have such a short window of time in the spring and fall to be outside & comfortable. Right now we've hit the 90 mark and the humidity is horrible! Your husband did an awesome job with the buffet. Hello there sweetest Linda! Always do you have the best table setting ready to make anyone feel like royalty. Enjoy a great long weekend! Wow, are you ever ready, Linda! Everything looks sooooo lovely esp. against the backdrop of your gorgeous home. I swear I don't know where you find the energy. I haven't bothered with a single patriotic item this year. I will put my flag out tomorrow though. Your patriotic tables and decorating style are fabulous my friend. I love your outdoor spaces and you have added the perfect Holiday touch to them all. I would imaging that you have some very lovely parties here. Wishing you a safe and enjoyable Memorial day weekend. Truly festive touches Linda Thank you so very much for joining us at Thoughts of Home on Thursday. Have a wonderful holiday weekend. Somehow I missed this post. Maybe it was because I was on vacation. Amazing post. 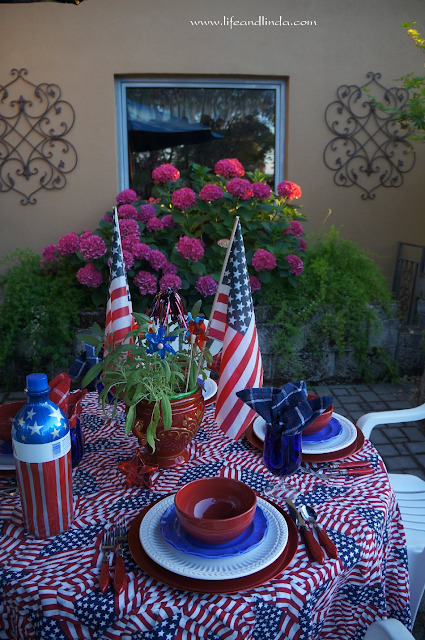 Your patriotic table and decor is so beautiful and festive. You have an amazing yard. Love that fountain. I love the last photo, how fun. Have a wonderful weekend. Beautiful tables and view. Lovely buffet. Hubby did good.